Just before it closed, I managed to get to see the Ravilious exhibition at the Dulwich Picture Gallery. This was a new experience for me insofar as it was the first exhibition I’ve attended with my 3-year-old; it was also quite crowded (sorry, anyone visiting who had listen to his demands that EVERYONE LOOK AT THE AEROPLANE! AND THE HORSEY! AND THE TRAIN! etc). Actually, it was a great exhibition for a child, with lots of objects in the pictures which appealed to him, and I’m pleased to say he actually discussed it with me afterwards, and proudly chose himself a postcard to take home (while I, having had to go a bit more quickly than usual, decided to buy the catalogue). 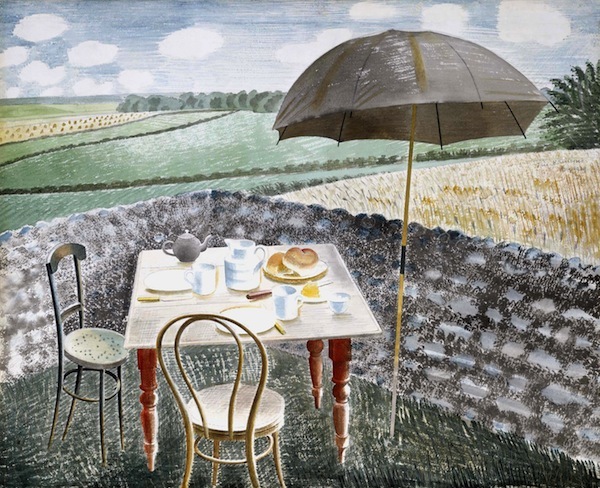 The exhibition was one of the most enjoyable I’ve seen for a while, though: Ravilious’s graphic art with its muted colours and restrained detail is absorbing and revealing. emotionally distant and nostalgic’. All of these seem fair comments, I think, and not necessarily exclusive to each other; his focus on objects rather than people, in the majority of his works, and often strange objects at that, leads us to conjecture about his paintings, wondering why a room is deserted, a bedstead of such interest, etc. 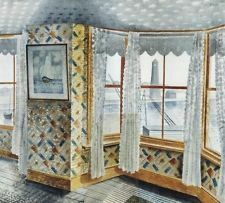 There is a strange sense of isolation and desertedness in many of his paintings, as if the inhabitants have just left a room but will never return – and yet the nostalgia for a pre-war England, with its faded wallpapers and old-fashioned furniture, is apparent, painted with care by someone who wanted to preserve something which was about to change forever. The exhibition demonstrates the astonishing range and flexibility of the artist’s approach: from woodcuts to watercolours, he seems to make a range of marks on paper in a variety of ways which somehow perfectly capture the mood of a scene, not faithfully replicating it but somehow infusing it with a sense of period, of loss or longing, even. 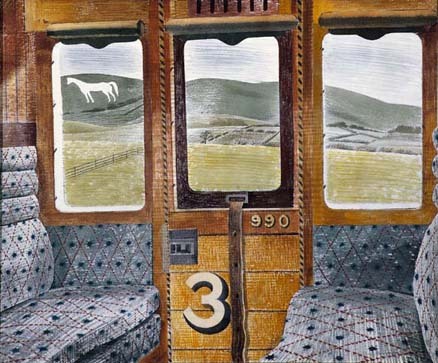 From domestic interiors to his work as a war artist (he died when his plane went down in 1942, aged only 39), to the seemingly random subjects such as derelict buses or a tea table, his works are always identifiably Ravilious, somehow, containing a hint of his unique vision. The exhibition divides his work by subject: ‘Relics and Curiosities’, ‘Figures and Forms’, ‘Interiors’, ‘Place and Season’, ‘Changing Perspectives’ and ‘Dark and Light’. 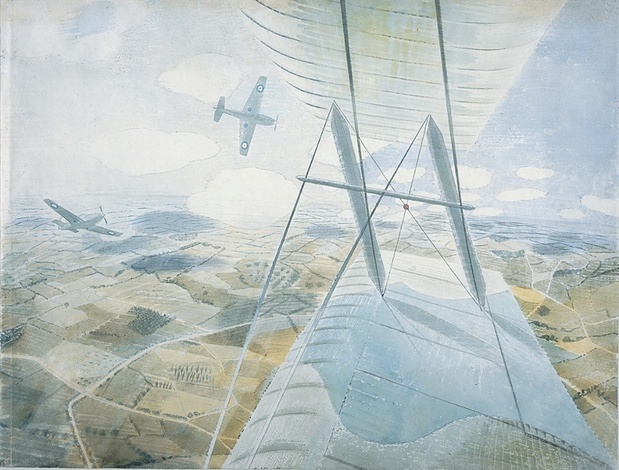 Interestingly, this approach is also broadly chronological, beginning with early work and concluding with his wartime watercolours, thus suggesting an arc of development in his ideas and methods as well as the range of subjects (or objects, perhaps!) that he studied. The constant is in his distinct eye, appearing in his consistent use of colour, brushwork, and unusual perspectives and angles, influenced (though not excessively) by his Modernist contemporaries. It is an exhibition to make us wonder, I think; the pictures inspire stories, conjecture, invented histories, alongside a sense of a real history of a time and a place which is no longer truly accessible to the modern world, for all that the landscapes are still with us, if somewhat altered. Ravilious wrote little about his work, so we don’t even have much of his own words to go on, to augment his work, though research has been done, particularly by his daughter, and his letters and biography are available – but they give away relatively little – and in a way I’m not sorry about this. Even information about the place and situation in which he painted still doesn’t really fill in the details which the viewer is invited to ponder, though. If you missed the exhibition, buy the catalogue, and dream up some stories. Love these images. They make it so easy for me to imagine myself stepping into that room, garden, train seat or other place. With the airplane image, it’s as if I can almost hear the engines from the other planes. It’s wonderful, isn’t it? Not at all realistic and yet so evocative they take you to a different place. They remind me a bit of the American artist Edward Hopper, in the sense that there’s a sense of stillness to some of them. Looking at the images you have in this blog post, it feels like I’m in the moment just before someone is going to say something or before I hear something from outside the window. 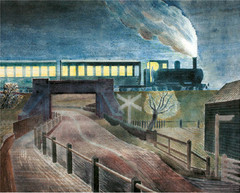 I didn’t discover Ravilious until rather late in my art history career. And had you asked me earlier would muted colours and restrained detail be absorbing, I would have definitely said no. It was Chalk Paths 1935 that turned me around. Yes, it’s not the sort of art I’d expect to be so engrossed by, either. It is a shame he died so young, as you say – I’d love to know how he would have responded to the postwar world!